Late in 1987, having graduated from college and headed to Taiwan to study more Chinese, I decided to attend an international conference on Confucianism. At lunchtime on the first day I was sitting by myself, intimidated by the luminaries all around, when a smiling scholar sat down across from me, introduced himself as Roger Ames, and immediately made me feel at home. (Although he did question the wisdom of my intention to attend a graduate school other than Hawaii.) 1987 also saw the publication of Thinking Through Confucius, Roger’s seminal collaboration with David Hall; shortly after I met Roger I obtained a copy and was inspired. This, I felt sure, was just the kind of thing that I wanted to do: engage deeply with the Confucian tradition in a manner that also challenged Western philosophy. 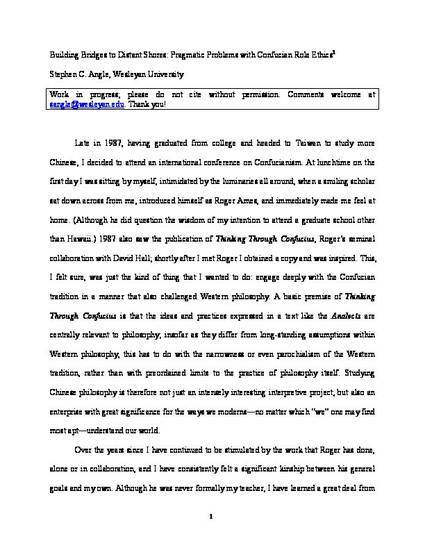 A basic premise of Thinking Through Confucius is that the ideas and practices expressed in a text like the Analects are centrally relevant to philosophy; insofar as they differ from long-standing assumptions within Western philosophy, this has to do with the narrowness or even parochialism of the Western tradition, rather than with preordained limits to the practice of philosophy itself. Studying Chinese philosophy is therefore not just an intensely interesting interpretive project, but also an enterprise with great significance for the ways we moderns—no matter which “we” one may find most apt—understand our world.